The Free Library is happy to announce that we've launched our new Online Catalog! As we mentioned on the blog and throughout social media last week, our goal was to help make our catalog more user-friendly, encourage exploration, and offer better customer service throughout your online experience. With new features that include a responsive layout (you can use the catalog on any device or modern browser, in desktop and mobile environments), refined search capabilities and item formats (i.e. Audiobook CD, Audiobook Download, Book Children, Music Download, and Music Vinyl), download digital items like ebooks and audiobooks directly from the catalog (no longer need to go through Overdrive separately), instant access to a library card through our new Online Registration process, and an overall more interactive experience with the introduction of our Library Community. We've created some tutorials to get you started as you explore the new catalog and we'll be debuting these videos over the next few days. Today's video will give you a guided overview of the new features and functionality in the My Account section of our Online Catalog. Visit the blog again later this week for more video tutorials on new and improved features in our Online Catalog and please let us know what you think in the comments, we want to hear from you! I was so excited and pleased when I first experienced your new site look---I called my local library [Parkway Central] and positively gushed like a small child who has just learned to ride a bike!! I love what you have done. Even though I had no problems using your old site---you have achieved a level of user friendly that even an OLD tech daily user such as myself can appreciate. Go Free Library!!! I must close by saying that my library card will always be my favorite credit card. Best of all, there is no monthly fee! 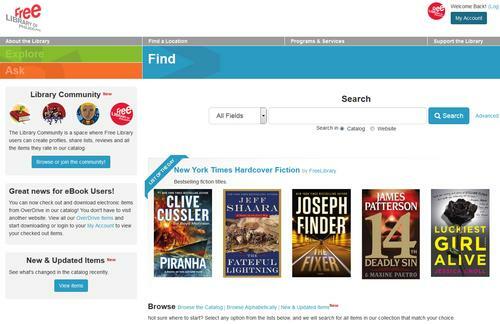 Add a Comment to Introducing The Free Library's New Online Catalog!